The Pluto - Uranus - Jupiter T-square that manifested circa 1934 is coming around again. Only this time, to make matters worse, it will incorporate retrograde Mars and go on to form a grand square on April 22, 2014. As some of may know, from reading my past articles, I follow the U.S. chart for the Signing of the Articles of Confederation which is on the left. Many of the fears astrologers have about this current aspect are based on what happened in the world in the 1930's. We lived through a major generational upheaval then. The sudden collapse of the stock market in 1929 brought about the Great Depression. By 1934, things got so bad that President Roosevelt closed 5000 U.S.banks temporarily (afflicted Pluto) and overhauled the whole industry.They sorted out those that were solvent, and closed the others. The government followed that by putting all the state chartered banks under a federal umbrella, with them all having to follow the same federal rules. The Glass-Steagall act was passed by Congress authorizing deposit insurance (the FDIC) and prohibited commercial banks from owning full-service brokerage firms. The banks were prohibited from investment banking activities, such as underwriting corporate securities or municipal revenue bonds. The law was designed to insulate bank depositors from the risk involved when a bank deals in securities and to prevent a banking collapse like the one that occurred during the Great Depression. That's a joke, as a 1999 banking act allowed banks to affiliate with securities firms and insurers through a holding company structure that permits nationally chartered banks to engage in most financial activities through direct subsidiaries. So the banks bypassed the law, and set up Financial Holding Company affiliates. So here we are again with enormous banking issues that are the root of our problems. The banks did indeed get to big to fail! I was born during that depressing cycle in our country, and would like to share what my personal background with that aspect has been all my life. I was born on January 27, 1934 at the height of the Great Depression. I have a T-square between Uranus at 23 degrees of Aries in my 10th house; (my father, who was an Aquarian, square Pluto at 23 Cancer in my 1st house; (my paternal grandmother; (food). This goes on to square Jupiter at 23 Libra in my 4th house (my mother) who was a Libra and came from a foreign land-Jupiter-the Ukraine. In fact, during World War II, anyone who wasn't a citizen could be deported unless they became one, which my mother was happy to do in 1943. Some other details of how this T-square played out in my life was that my paternal Italian grandparents, who were previously successful in the family wholesale food business lost everything. I was her favorite, which sure fits the link between us. She used to feed me coffee and donuts for breakfast, which I still like to this day. I am told that they lost a beautiful mansion that even had a ballroom on the third floor. My folks also lost their beautiful home, and we had to move into a family owned run down third story cold water flat in the Italian district for many years; that was until my folks could get back on their feet again. The irony is that my natal Jupiter in my 4th house (which also relates to later in life) trines my natal Venus and Mars in my 8th house of inheritance. So in 2004 I sold my ordinary average inherited home in Milwaukee Wisconsin, and now live in an almost 54,000 sq ft home. We call it our Italian Villa, as it was built in that style, by an Italian man. At that time, In Europe, afflicted Pluto strengthened the power of their three ruthless dictators (Hitler-Mussolini and Franco.) Stressed Uranus then brought about important developments in air power and rocketry, which in Germany were geared strictly for military purposes. Jupiter inclined America as well as other countries to be isolationists; because of terrible World War I memories. In other words, Americans felt like we should mind our own business! With this T-square turning into a Cardinal Grand square presently, we do see some repeating themes. Putin occupying the Crimea militarily, to (as he says) unify the Russian speaking people is what Hitler did when he annexed the Rhineland so (as he said) was to unite German speaking people. Hitler violated the terms of the Treaty of Versailles and the Locarno Pact, and Putin is snubbing his nose up at the protection provided by NATO to its member nations. Besides the Putin flap, we have also seen some other events triggered by this T-square as it manifests. The lost Malaysian airliner (Uranus) was one. The earthquake in California on March 28th, (Uranus)was another, as well as the terrible mud slide that happened in Washington State on March 22nd. To add to this turbulent time frame, there is another aspect I watch every year that I would like to share with you. 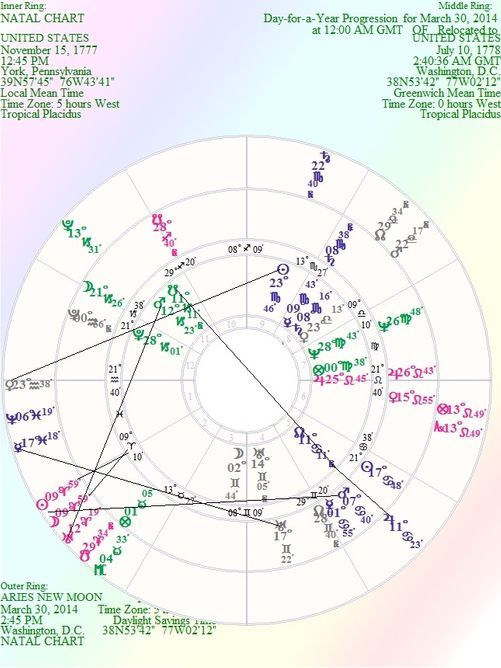 It is when the Sun reaches 27-28-29 degrees of Aries around April 18-19-20, for at that time it squares the natal and progressed Pluto at 28 Capricorn 01 and 0 Aquarius 56R in the 12th house in the U.S. chart. Here are some of the terrible events that have happened around that time frame down through the years. Keep in mind, Aries is a sign that is willful, aggressive, assertive, powerful with warrior type energy; and its ruler Mars, rules guns. On April 18, 1983 a suicide bombing attack against the United States Embassy in Beirut, Lebanon killed over 60 people, mostly embassy staff members and U.S. Marines and Sailors. It was the deadliest attack on a U.S. diplomatic mission up until then, and is seen by some as marking the beginning of anti-U.S. attacks by Islamic groups. The Waco Siege, also known as the Waco Massacre ended on April 19, when the United States Bureau of Alcohol, Tobacco, and Firearms (ATF) attempted to execute a search warrant at the Branch Davidian ranch at Mount Carmel, Texas. An exchange of gunfire resulted in the fiery deaths of seventy six people people, including four F.B.I. agents, more than 20 children and two pregnant women, along with Davidian leader Vernon Wayne Howell, better known as David Koresh. The Columbine High School massacre occurred on Tuesday, April 20, 1999, at Columbine High School in Columbine in unincorporated Jefferson County, Colorado, United States, near Denver and Littleton. Two students, Eric Harris and Dylan Klebold, embarked on a massacre that killed 12 students and a teacher, as well as wounding 23 others, before committing suicide. It is the fourth-deadliest school shooting in United States history. So I am on the lookout for more of this type of violence this year, but I certainly hope it skips us this time around, as we have enough to deal with. And as if the aforementioned set of aspects aren't powerful enough, the New Moon in Aries today on March 30th gives us an added kick in the head. Mercury squaring progressed Uranus in the U.S. 4th promises more earthquakes, and wild weather swings. Blizzard, high winds, electrical storms, floods and ground cave-ins are all possibilities! The New Moon right on the 2nd house cusp squares progressed Mars in the 5th could drag the stock market down. And speaking about money and the banking industry-because more money is just being printed, with nothing to back it, there could be a change to people using a virtual currency. They are bit coins, and they, or something like them could be the catalyst for making a dent in banking power, control and profits. There is no middleman connected, and the banking industry wouldn't have any part in the use of this new currency. You simply would use them as you shop effortlessly on the Internet. Transiting Venus square the Sun in the 9th doesn't bode well for friendly encounters with foreign leaders. I hope nothing unexpectedly happens to one of them, especially President Obama! Neither does the exact Grand Cross on April 22nd involving retrograde Mars. No one wantwill we s to see a return to the Cold War, but handling Putin's aggression with sanctions doesn't seem to phase him a bit He said he will just look to the East instead of the West for trade and other purposes. So what do about it, really? Not much! But getting back to the new Moon chart, transiting Mercury trining the progressed Sun in Cancer tells us that women are the favored spokespersons now in delicate situations. This could be the forerunner to having a woman president in the next election. And why not? Its the gals that carry and deliver babies, so they would be less inclined to use them as human fodder when they grow up. As women gain more political power, the world may be realizing that men are just to testosterone driven to be in control of everything, all the time, although the Equinox Moon in Capricorn on the 12th house cusp squaring retrograde Mars in the 8th suggest that men in power aren't ready to give it up without a fight. However, transiting Jupiter conjoining the natal U.S. node, which goes on to oppose the south node indicate that the old political ways have to be revamped to insure peace and cooperation world wide. The Cancer implications show us that the housing market is still a problem in need of some innovative solutions. This equinox chart has Uranus squared to natal U.S. Mars by 4 minutes of arc from the second house of money and values to the 11th house of Congress. This implies that gay rights issues (Uranus) and all that implies is in an uphill fight with the conservative powers that be. 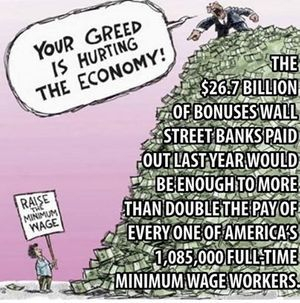 This also goes for raising the minimum wage. The picture below shows us what is wrong with this country!